Hope Cottage01263 715779work01603 870304fax Self-cateringHeacham is a great holiday destination and Hope Cottage is a super cottage to stay in. Well equipped and well presented, it is also close to the local shops and pubs/restaurants and just a short walk to the fabulous sandy beach that hugs this part of the coast. There is a small, sunny garden to the rear for eating out in on warmer days and a woodburner to gather round when returning from a walk, birdwatch or trip to the golf course in the autumn. The area has much to offer with watersports and beach activities, the famous Norfolk Lavender Farm is in the village and it also has a great farm shop, showcasing the local produce Norfolk is so famous for. With historic houses nearby at Sandringham and Houghton, golf courses in the area and the historic port of King's Lynn a short drive away, this area has much to offer and one visit may not be enough. 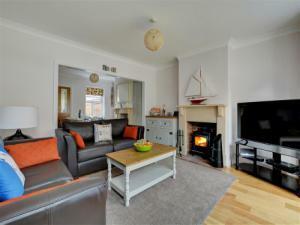 Heacham is a great holiday destination and Hope Cottage is a super cottage to stay in. Well equipped and well presented, it is also close to the local shops and pubs/restaurants and just a short walk to the fabulous sandy beach that hugs this part of the coast. There is a small, sunny garden to the rear for eating out in on warmer days and a woodburner to gather round when returning from a walk, birdwatch or trip to the golf course in the autumn. The area has much to offer with watersports and beach activities, the famous Norfolk Lavender Farm is in the village and it also has a great farm shop, showcasing the local produce Norfolk is so famous for. With historic houses nearby at Sandringham and Houghton, golf courses in the area and the historic port of King's Lynn a short drive away, this area has much to offer and one visit may not be enough.